Religion in the United States is often described as a vibrant marketplace where individuals pick and choose religions that meet their needs, and religious groups are compelled to compete for members. The Landscape Survey confirms that, indeed, there is a remarkable amount of movement by Americans from one religious group to another. Together with other sources of change in religious affiliation, such as immigration and fertility rates, this shifting helps account for the great dynamism of American religion. Looking only at changes from one major religious tradition to another (e.g., from Protestantism to Catholicism, or from Judaism to no religion), more than one-in-four U.S. adults (28%) have changed their religious affiliation from that in which they were raised. 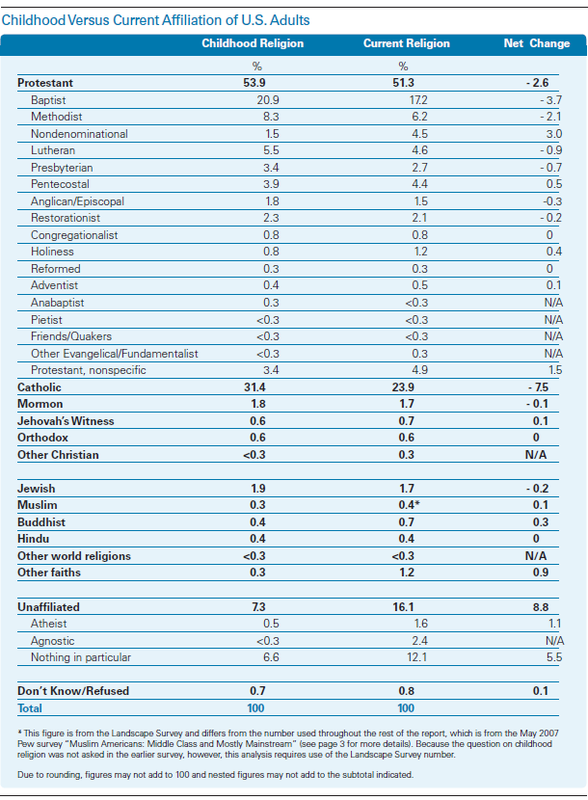 If change of affiliation within the ranks of Protestantism (e.g., from Baptist to Methodist) and within the unaffiliated population (e.g., from nothing in particular to atheist) is included, roughly 44% of Americans now profess a religious affiliation that is different from the religion in which they were raised. If anything, these figures may understate the extent of religious movement taking place in the U.S. For instance, they do not include individuals who have changed affiliation within a particular denominational family, say from the American Baptist Churches in the USA to the Southern Baptist Convention. Nor do they include people who changed religious affiliation at some point in their lives but then returned to their childhood affiliation. Moreover, these figures do not capture multiple changes in affiliation on the part of individuals. Although there are net “winners” and “losers” in the U.S. religious marketplace, the survey underscores the fact that all groups are gaining and losing individual adherents. Even groups that are net losers are attracting new members – just not enough to offset the number who are leaving. Conversely, groups that are net winners are also losing some adherents, but these losses are more than offset by the number of people who are joining these groups. This chapter closely examines the net winners and losers from changes in religious affiliation and documents the high degree of turnover among American religious groups. It also analyzes the patterns of membership gain, loss and retention among religious groups and describes the demographic characteristics of the many Americans who are “on the move” religiously. Which groups are the net winners and losers in the dynamic process of shifting religious affiliation? By comparing the distribution of the current religious affiliations of U.S. adults with their childhood religious affiliations, the Landscape Survey is able to provide a clear sense of the net effect of these movements within American religion. 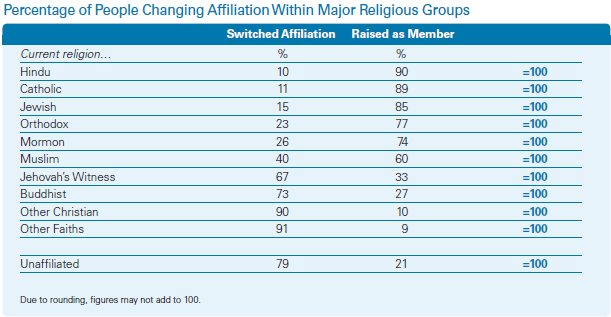 The biggest gains due to changes in religious affiliation have been among those who say they are not affiliated with any particular religious group or tradition. Overall, 7.3% of the adult population says they were unaffiliated with any particular religion as a child. Today, however, 16.1% of adults say they are unaffiliated, a net increase of 8.8 percentage points. Sizeable numbers of those raised in all religions – from Catholicism to Protestantism to Judaism – are currently unaffiliated with any particular religion. Another group that shows a net gain is nondenominational Protestants, whose share of the population has more than tripled as a result of changes in affiliation; 1.5% of the population was raised within nondenominational Protestantism, compared with 4.5% who currently report such an affiliation. Groups that have experienced a net loss from changes in affiliation include Baptists (net loss of 3.7 percentage points) and Methodists (2.1 percentage points). However, the group that has experienced the greatest net loss by far is the Catholic Church. Overall, 31.4% of U.S. adults say that they were raised Catholic. Today, however, only 23.9% of adults identify with the Catholic Church, a net loss of 7.5 percentage points. The significant effect of immigration on the size of the U.S. Catholic population underscores the fact that while changes in affiliation are a major factor contributing to the size of religious groups, they are by no means the only factor. In addition to immigration, other factors – such as differential fertility and death rates – also contribute to these shifts. As stated above, although there are net winners and losers in the process of religious change, no group is simply losing members or simply gaining members. Rather, each religious group is simultaneously gaining and losing members. To get the most complete picture of the dynamism of the American religious landscape, one must look at the total number of people entering and leaving each religion. A similar dynamic is at work within Catholicism, but with very different results. Overall, 2.6% of the U.S. adult population has switched their affiliation to Catholic after being raised in another faith or in no faith at all. But nearly four times as many people (10.1% of the adult population overall) were raised in the Catholic Church but have since left for another faith or for no faith at all. Other groups that have experienced high levels of change include Baptists and Methodists. Some 8.3% of the U.S. adult population was raised Baptist but is no longer Baptist, and 4.4% of the adult population was raised Methodist but has since moved away. But Baptists and Methodists also have attracted a significant number of new adherents from other faiths. Some 4.5% of the adult population was raised as something other than Baptist but is now Baptist; the number for Methodists is 2.4%. In addition to documenting the high degree of religious movement in the U.S. population and the net winners and losers from changes in affiliation, analysis of the Landscape Survey also details which groups are most heavily comprised of people who have changed their affiliation, what faiths these people came from and which religious groups are most successful at retaining their childhood members. The religious traditions most heavily comprised of people who have switched affiliation include the unaffiliated, Buddhists, Jehovah’s Witnesses, members of the “other faiths” category (e.g., Unitarians, members of New Age groups and members of Native American religions) and members of the “other Christian” tradition (including metaphysical Christians). For instance, more than two-thirds of Jehovah’s Witnesses were raised in some other faith or were not affiliated with any particular religion as a child, as were nearly three-quarters of Buddhists. Among people who are currently unaffiliated with any particular religion, nearly eight-in-ten were raised as members of one religion or another. 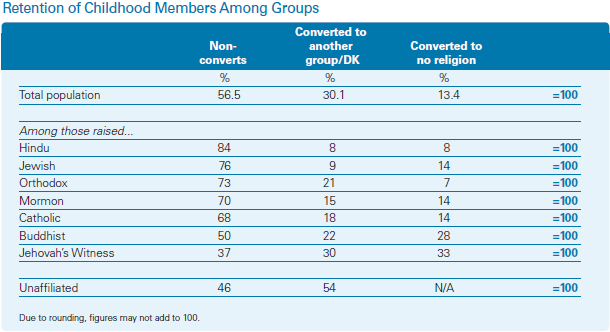 Hindus, Catholics and Jews are the groups with the lowest proportion of members who have switched affiliation to these respective faiths. Overall, nine-in-ten Hindus were raised Hindu, 89% of Catholics were raised Catholic and 85% of Jews were raised Jewish. Overall, fewer than one-in-five Protestants (16%) were raised outside of Protestantism. This means that more than eight-in-ten Protestants were raised either in the same Protestant family (e.g., Baptist, Methodist, Lutheran, etc.) 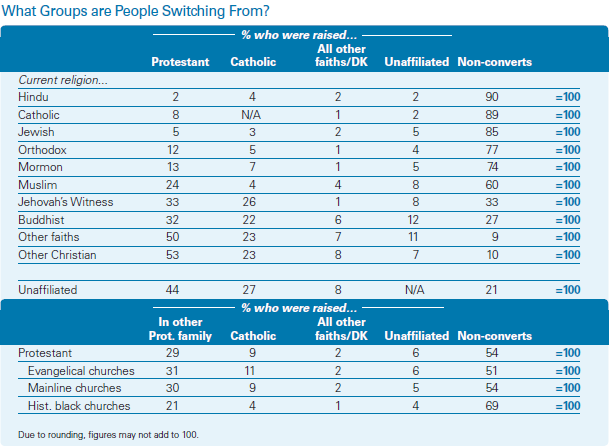 with which they are currently affiliated (54%) or have switched from one Protestant family to another (29%). About one-third of both evangelical and mainline Protestants have switched their affiliation from other Protestant families (31% and 30%, respectively), and nearly one-in-five have changed affiliation from outside of Protestantism (18% and 16%). Members of historically black Protestant churches, by comparison, are much less likely to have moved either from another Protestant family (21%) or from outside Protestantism (10%). It is also interesting to see which childhood faiths people leave behind. Most people who have changed their affiliation to one of the Protestant traditions, for instance, are people who were raised in another Protestant denominational family. But overall nearly one-in-ten Protestants were raised in the Catholic Church. Among those who are currently unaffiliated with any particular religion, nearly half (44%) were raised as Protestant and more than one-in-four (27%) were raised as Catholic. Jehovah’s Witnesses and Buddhists both draw large numbers of people who switch their affiliation from Protestantism and Catholicism, as do members of other faiths, including Unitarians and members of New Age religions. For example, more than one-in-three of all Jehovah’s Witnesses (33%) were raised Protestant, while 26% were raised Catholic; the comparable numbers for Buddhists are 32% and 22%, respectively. Finally, the Landscape Survey makes it possible to look at which groups are most successful in retaining their childhood members. Hinduism exhibits the highest overall retention rate, with more than eight-in-ten (84%) adults who were raised as Hindu still identifying themselves as Hindu. The Mormon, Orthodox and Jewish traditions all have retention rates of at least 70%, while the retention rate for Catholics is 68%. As mentioned previously, the group that has exhibited the strongest growth as a result of changes in affiliation is the unaffiliated population. Nevertheless, the overall retention rate of the unaffiliated population is relatively low (46%) compared with other groups. This means that more than half (54%) of those who were not affiliated with any particular religion as a child now identify themselves as members of one religion or another. Two of the religious groups with the lowest retention rates are Jehovah’s Witnesses and Buddhists. Only slightly more than a third (37%) of adults who were raised as Jehovah’s Witnesses still identify themselves as Jehovah’s Witnesses. Half of all of those who were raised as Buddhists (50%) are still Buddhists. 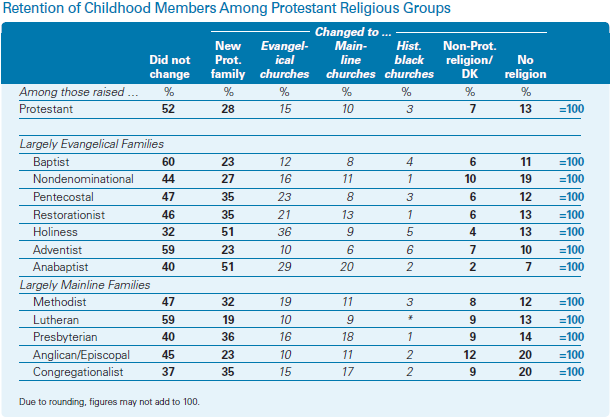 Roughly half of those raised as Protestant (52%) retain their childhood religious affiliation, but this comparatively low number relative to other groups is largely due to the fact that the change figures reported here include movement between Protestant denominational families. In fact, of the 48% of people who were raised Protestant but now belong to something other than the denomination in which they were raised, the majority of them now belong to another Protestant denomination. Overall, then, 80% of those who were raised as Protestant are still Protestant, either within the same denominational family in which they were raised (52%) or within another Protestant family (28%). So only one-in-five (20%) adults who were raised as Protestant have left Protestantism altogether (7% for a non-Protestant religion and 13% for no religion at all). Of all of the Protestant families, Baptists, Adventists and Lutherans have the highest retention rates, at roughly 60% each. The Holiness, Anabaptist and Congregationalist families, by contrast, have much lower retention rates, below 40% each. 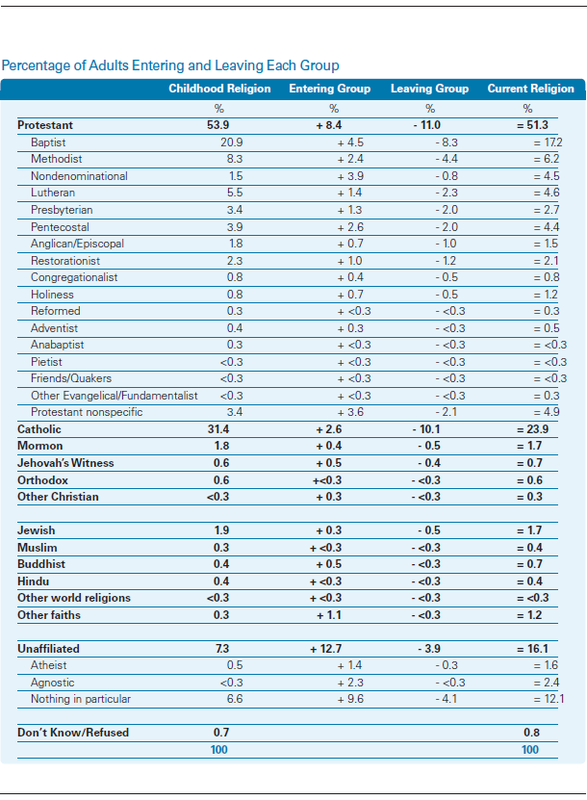 All Protestant denominational families lose a considerable number of childhood adherents to the ranks of the unaffiliated (ranging from 7% among those raised Anabaptist to 20% among those raised in Congregationalist and Anglican/Episcopal churches). The data also show that among those who have left largely evangelical denominational families for other Protestant families, more have become members of other largely evangelical families compared with the number who have become members of largely mainline families. By contrast, those leaving largely mainline denominational families are more evenly divided, with approximately equal numbers joining other largely mainline families and largely evangelical families. 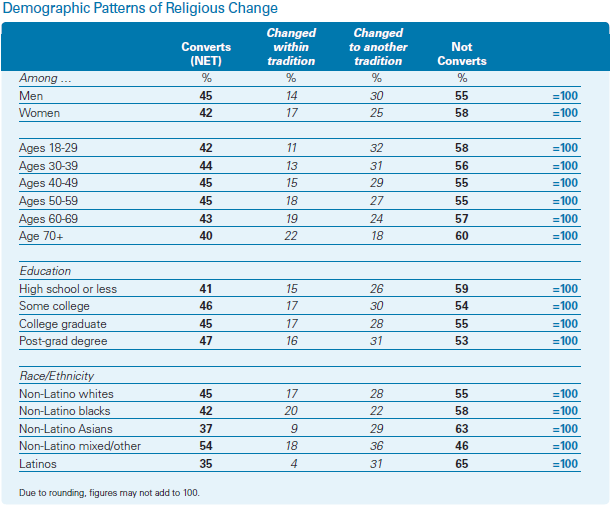 The most significant demographic differences in rates of affiliation change are found among the different racial and ethnic groups in the U.S. For example, about a third (35%) of Latinos and a similar number of Asians (37%) report having changed their religious affiliation from that in which they were raised. These rates are significantly lower than those seen for both blacks (42%) and whites (45%). Though the rates of change in affiliation among the different age groups are fairly comparable, there are interesting generational differences in the types of affiliation changes people undergo. Among people age 70 and older, for instance, more than half of people who have changed affiliation have switched affiliation from one family to another within a religious tradition (e.g., from one Protestant denominational family to another). Among those under age 30, by contrast, roughly three-quarters of those who have changed affiliation left one religious tradition for another (e.g., left Protestantism for Catholicism) or for no religion at all. With respect to other demographic characteristics, the Landscape Survey reveals few major demographic differences in the rates of religious change. For instance, men are only slightly more likely to switch affiliation than women (45% vs. 42%). Similarly, there are few differences among adults with different educational backgrounds. Americans with a high school education or less are only somewhat less likely to have switched affiliation from the religion in which they were raised (41%) than people with at least some college education, college graduates and people with a post-graduate education (46%, 45% and 47%, respectively). The Landscape Survey finds that 27% of married people are in religiously mixed marriages. If marriages between people of different Protestant denominational families are included, the number of married people in religiously mixed marriages is nearly four-in-ten (37%). Among married couples, young people are more likely to be in religiously mixed marriages as compared with their older counterparts. Among all the major religious traditions, Hindus and Mormons are most likely to have a spouse with the same religion (90% and 83%, respectively). Nearly four-in-five Catholics (78%) and seven-in-ten Jews (69%) are also married to someone with the same religious affiliation. By contrast, majorities of the unaffiliated population, members of the “other faiths” category and Buddhists are married to someone of a different religious background than their own. For example, only four-in-ten (41%) unaffiliated adults are married to a spouse who is also unaffiliated. About six-in-ten married Protestants (63%) are affiliated with the same Protestant denominational family as their spouse, and an additional 18% have a spouse who belongs to a Protestant family different from their own. 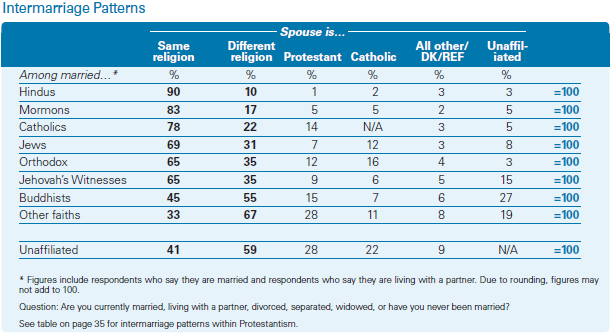 In total, 81% of all married Protestants are married to other Protestants, while 10% are married to Catholics, 6% to spouses who are not affiliated with any religion and 3% to people who belong to other religious groups. These patterns vary significantly among the three Protestant traditions, however. Members of evangelical Protestant churches (68%) and historically black Protestant churches (69%) are more likely than members of mainline Protestant churches (55%) to have the same affiliation as their spouse. Among married members of evangelical and historically black churches, only 15% and 12%, respectively, are married to non-Protestants. By contrast, more than one-in-four (26%) married members of mainline churches are married to non-Protestants. Of these, 15% are married to Catholics, 8% to people not affiliated with any particular religion and 3% to members of other religious groups. The Landscape Survey findings also make it possible to gauge, at least indirectly, the importance of marriage in changes in religious affiliation.